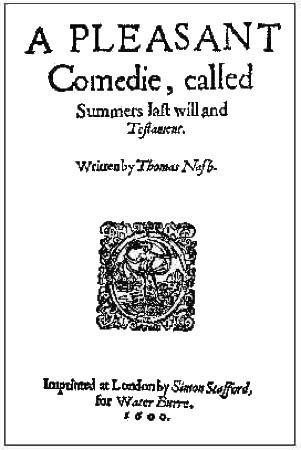 Thomas Nashe, "Summers Last Will and Testament" (1600), stage directions: "Here enter 3. Clownes, and 3 maids, singing this song, daunsing. Trip and goe . . ."
Sir Philip Sidney, "Astrophel and Stella" (1591), see Nashe's preface: "Indeede, to say the truth, my stile is somewhat heauie gated, and cannot daunce trip and goe so liuely, with oh my loue, ah my loues gone, as other Sheepheards that haue beene fooles in the Morris time out of minde . . ."
John Bennet "Round about in a fair ring: The elves dance," (1614) in Invitation to Madrigals #5, Thurston Dart, ed., Galaxy Music (Stainer and Bell) 1971: "Round about, round about in a fair ring-a, Thus we dance, thus we dance, and thus we sing-a: Trip and trip and go, to and to and fro, over this green-a. All about, in and out, all about, in and out, all about, in and out, over this green-a."